Nesting season is happening in many places, so there is still time to help breeding birds in your backyard. Here are three easy things you can do to make nesting and raising chicks easier for the birds in your backyard. neighborhoods, people remove natural debris, sticks and vegetation. Maybe it looks “clean”, but it certainly isn’t natural and birds need natural dead vegetation to build their nests. If you can, leave sticks and other dead vegetation on the ground in your yard. You can gather these natural materials, including moss, dead leaves and even pet fur, into piles or baskets, or hang them in mesh bags making them easy for birds to find. You can also leave bits of string or strips of old cloth out as well. Don’t use any materials, such as dryer lint, that could have harsh chemicals that would be harmful to birds and their nestlings. But locks of hair are always welcome! Birds like Robins need mud for their nests and if you have an area in your yard that doesn’t grow a lot of plants….consider making it a little mud area for birds to harvest. They will be very happy digging around after you have done a little watering. 2 — Provide a constant source of clean water. A water feature in your yard, such as a flowing fountain or clean bird bath, will attract more birds. Birds need water to stay hydrated, but just as important they need it to keep their feathers clean. On hot, dry days you will attract lots of birds to your yard by providing a consistent and reliable source of water, so they know where to go. But if you provide water, keep it clean! If the water is stagnant, it could become a transmission site for diseases. Change the water every few days, and scrub the container. Hot water usually does the trick, but if you use chemicals to disinfect it, make sure you flush out all the chemicals with lots of clean water as they can be harmful to birds. 3 –Keep your kitty friends inside. If you are making your yard more attractive to birds, it is your responsibility to keep them safe from human sources of danger, which includes your pet cat. Cats are cute, but they are deadly to birds. Cats have predatory instincts that can’t be satiated with cat food, and given the chance, a cat will kill birds and other wildlife — a fact which many cat owners can attest to when the cat bring back dead birds and mice. Once baby birds leave the nest, they often spend the first several days on the ground as they learn to fly, which makes them easy picking for any cat or dog. When raised indoors many cats do not feel the urge to go outside. But, if you really want your cat to be able to get outside for at least part of the day, you could consider a catio — an outdoor patio for your cat! 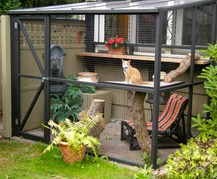 Your cat will still get to enjoy time outside, and the birds in your yard will be able to safely raise their chicks. Build your own or buy one — get as creative as you want and make everyone happy! If you provide just these three things, the birds in your backyard will repay you with chicks you can watch grow and fledge. Pretty satisfying!